Can I have pumpkin pie, ma? Years later Melbourne was lucky (?) enough to have USA Foods open where we can buy everything from cookies masquerading as breakfast cereal and Libby’s pumpkin pie filling. 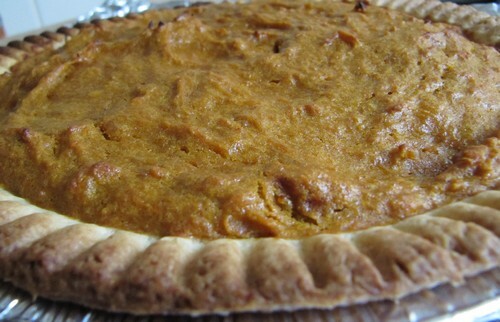 Out of sheer curiosity I made a pumpkin pie and liked it. This one is a bit different as I made it from a pumpkin rather than the caned stuff and are a bit surprised that it looks successful. I’m yet to taste it though. Half a pumpkin. I used a Queensland Blue, but a Butternut would probably work better. 1 tbs Pumpkin pie spice. I got mine from USA Foods, but you can mix your own from cinnamon, nutmeg and all spice. 1. Cut up the pumpkin, wrap in foil and bake until soft.Cool. 2. After the pumpkin has cooled, puree it. 3. Remove water from the pumpkin by wringing it out in a cloth. 4. Mix pumpkin with other ingredients. 5. Pour into shell and bake at 180’C for roughly 40 minutes. If the crust starts to burn wrap foil over the edges. The pie is cooked when a knife comes out clean. Refrigerate and enjoy with cream or ice cream.